David Canary was a busy actor in cinema, and mostly on television. 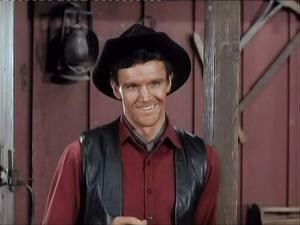 He is best remembered for his role as Candy in Bonanza; and his long-time stint on the daytime soap, All My Children. After Canary served a tour of duty in the Army, his first Hollywood assignment was as a semi-regular in the prime time serial Peyton Place. In 1967, he appeared in the now-classic Western Hombre with Paul Newman, Richard Boone, and Cameron Mitchell. When David Dortort was looking for a new foreman for the Ponderosa Ranch, he saw Canary in Hombre and cast him in Bonanza. Later that year, A contract dispute between Leonard Nimoy and the producers of Star Trek (including Gene Roddenberry) forced them to compile a list of candidates for consideration to takeover the role of Mr. Spock. As revealed in Star Trek – The Inside Story, David Canary (right) was almost selected. Other films Canary appeared in include The St. Valentine’s Day Massacre, The Computer Wore Tennis Shoes, Melvin Purvis: G-Man, and Posse. He guest-starred in many television shows, such as Gunsmoke, Alias Smith and Jones, The F.B.I., Kung-Fu, Hawaii 5-0, Police Story, The Rookies, S.W.A.T., Touched By an Angel, Law & Order, and most recently, Curb Your Enthusiasm. His soap opera appearances include Another World, Search for Tomorrow, and One Life to Live. He garnered five Daytime Emmy Awards as Outstanding Lead Actor, and has been nominated an additional eleven times, most recently in 2008. Canary was in numerous musical / stage roles in productions such as Man Of La Mancha, Kismet, and The Fantastiks, as well as dramatic performances in The Seagull and Macbeth. The actor also made several appearances at the Lake Tahoe site of the Ponderosa Ranch, a tourist attraction from 1967-2004. This entry was posted on Tuesday, November 24th, 2015 at 7:33 pm	and is filed under Blog by Manny Pacheco. You can follow any comments to this post through the RSS 2.0 feed. Responses are currently closed, but you can trackback from your own site.